Living in different countries and continents, my family has always had a challenging time figuring out a city for us to come together in order to spend time with each other. The last time that all my siblings and parents managed to convene in a single place was 2006 in the most central point between Australia, Malaysia, and the USA – Hawaii. Ironically, it took less time for my folks in Australia to get there than my travels from Washington DC; a missed connection even further extended my trip to around 18 hours long! So, last year, when my cousin, living in London, invited the family to her summer home in Tuscany, Italy, most of us jumped on the invitation without any hesitation. It was a great opportunity for my sisters’ families, me and my parents to catch up with each other, and for us to savor the Italian experience. This has always been a dream of mine to travel to this part of the world for its amazing scenery, architecture, fine arts, and culinary arts. The 11-day trip through the Tuscan countryside and stay at Volterra exposed me to its glorious cuisine that gave me a new perspective on Italian food. It was this foodie’s dream come true and a trip worth a thousand bites. Being an online restaurant coupon junkie, I sometimes am tempted to buy as many offers that show up in my inbox. But when two sites advertised such discounts for the upscale restaurant I Ricchi, I did not have the slightest hesitation in clicking the “buy” button as I had heard about this reputable place for many years but had never visited it, despite both of us arriving in DC at the same time in 1989. With a newfound appreciation for authentic Italian cuisine, I knew I could not forego these opportunities, and it was time for me to visit the Italian restaurant to re-live my Tuscan trip. Entering a high-end restaurant with impeccably looking staff such as I Ricchi can sometimes be a bit unnerving and maybe intimidating. But upon stepping into the foyer, there is a slightly relaxed charm about the place that is quite devoid of stuffiness. The front desk staff were nice and amenable to me, especially after I requested a well-lit table for my photography. My waiter, Justin, was professional, warm, and personable, and he was quick to put me to ease with his charm and knowledge of the menu. Right then, I knew I was in good hands and ready for a wonderful culinary journey. 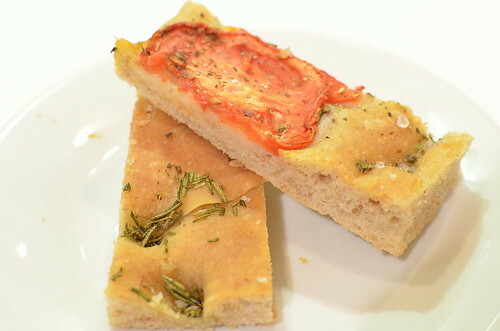 A basket of house-made slices of rosemary-topped and tomato-topped focaccia with large sea-salt granules immediately transported me back to Levanto where I stood in line for 30 minutes for this freshly-baked bread (which was truly divine), and this restaurant’s version was superb. The journey had already started with the first wonderful bite. I decided to “travel” on these Tuscan dining experiences (two visits in a week) the Italian way by ordering my meal in various separate courses, very much like how it is done on the Continent. 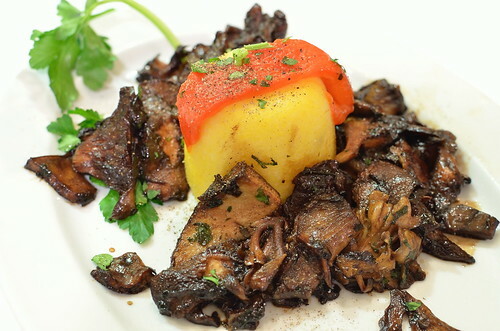 On my first visit, for the antipasti course, I ordered the day’s special of Truffled Polenta with Mixed Mushroom (Polenta Tartufata ai Funghi Farciti). The heady scent of truffle oil in the soft rich polenta cake was delightful from the first mouthful, which quickly brought me back to Volterra where I had a heavenly dish of Ricotta gnocchi topped by a tall heap of truffle shavings. Surrounding this cornmeal mound was a melange of sautéed portabello and porcini mushroom that had been deglazed with Balsamic vinegar. It was a very satisfying dish but after some time, I could not detect the delicate truffle scent once it was overwhelmed by the sweet and oaky vinegar. I had wished that its dark glaze was drizzled around the dish which would allow the diner to control its level of intensity in relation to the truffled polenta. However, such detail did not deter me from wiping the dish clean. A Salad of Arugula with Orange, Fennel, and Pecorino Cheese (Ruccola con Aranche e Pecorino) was the opener on my second trip. 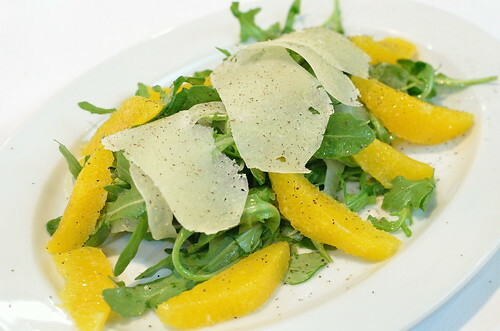 The peppery arugula leaves were tempered by the sweet orange segments and slivers of shaved pecorino cheese that added a smooth nuttiness to the biting greens. It was a well-made salad that was balanced by the different strong elements on the plate. I nearly forgot about the very thin fennel shavings that seemed to be missing the anise-like flavors for I suspect they had been macerated in lemon juice, which mellowed them out – this missing flavor dimension would have given the dish that extra touch. Nevertheless, it was definitely worth ordering this classic Tuscan Salad. For the pasta course, I ordered the Tortelloni in Sage Butter Sauce (Tortelloni al Burro e Salvia). This is another classic with large-size tortellini made from thin fresh pasta filled with a savory mixture of Ricotta cheese and Spinach. The sage scented butter sauce was the perfect accompaniment to the delicate pillows. The hint of lemon juice in the sauce was the right amount of acid to cut through the rich butter and Ricotta. The pasta was cooked al dente the Italian way which tends to be firmer than what we over here prefer it to be. Maybe a minute more in the boiler would have been perfect for my taste, but the stuffed tortelloni dish was just the right pasta course. On the next visit, I decided to go for a dish that was similar to a wild boar pasta dish I had eaten throughout my Tuscan trip – Fresh Pasta with Rabbit Sauce (Pappardelle Sul Coniglio). 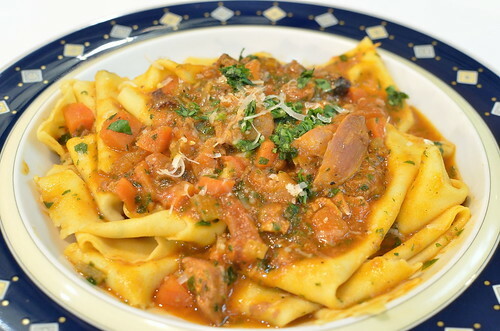 Wide ribbons of egg pasta were covered with a tomato-based sauce, which was cooked with aromatics of sweet carrots, mellow onions, and pungent celery. Chunks of tender rabbit meat enrichened the ragu that was paired with the wide and delicate pappardelle, whose broad width added to the dish’s heartiness. I could not help but relive the sense of satisfaction similar to eating the Italian wildboar version as this restaurant’s offering did conjure up the same flavors on my taste buds – another successful classic pasta dish that I could eat more of! The Tuscan countryside is reknowned for its high quality meats that end up on the table as main courses or cold cuts. With this in mind, I focused on such offerings during my two visits. 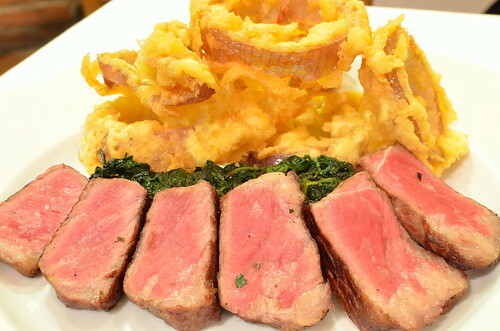 The day’s special offering of Grilled Steak with Onion Rings and Truffled Spinach (Bistecca al Ferri con Cipolle Fritte e Spinaci al Tartufo) caught my eye on the first visit. The steak was perfectly cooked (medium-rare) and it was juicy due to its heavy marbling. Its stay on the firewood grill gained a level of smokiness that reminded me of the humongous Bistecca Fiorentina that I savored in Volterra. The choice of red onions for the Onion Rings added an unexpected sweetness in this obligatory side order. The truffle oil in the sautéed spinach added a nuttiness and je ne sais qoui that elevated the dark greens. This steak may not be the superlative Chianina beef that I tasted in Italy, but it sure was close to it judging by what was left on the plate. Costolette D’Agnello a Scottadito was my meat course on the second trip. It is grilled lamb chops marinated in lemon and rosemary. The thick tender pieces of lamb had a rosemary scent that cut through any “gaminess” that this meat could sometimes exude, while the hit of lemon juice further mellowed the rich lamb. The first bite took me by surprise with a citrus jolt that hit the taste buds first. But upon chewing the meat, the various elements mixed rather harmoniously into a tasty bite. 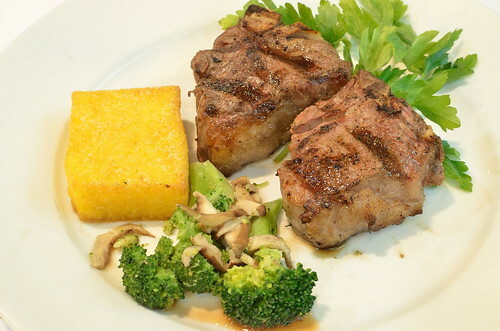 A fried polenta cake and some broccoli with shiitake mushrooms were satisfactory sides to the meat. Another successful meat course on the menu with this dish. An Italian dining experience would not be complete if one did not have a few bites of Dolci or Italian dessert. The menu has the recognizable offerings of Tiramisu, Biscotti, and Gelatos. Even though there was not much room left for this final course, I ended up with the house’s version of Walnut Crust Mascarpone Cheese Cake (Torta Di Formaggio). 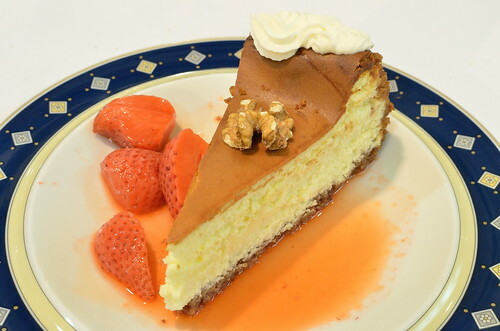 It is a lighter cheesecake whose crust, made with bits of walnut, sets it apart from others. A light sauce made up of pieces of strawberry macerated in lemon juice was the right partner that provided enough sweet citrus hit to cut through the cake’s richness. It was difficult to put my fork down despite the level of satedness I was already feeling. I Ricchi serves a clientele that comprises of DC bigwigs and members of the diplomatic and politico communities. And such clout and the restaurant’s well-established reputation are reflected by the not-so-modest bills that I received at the end of my meals. But this restaurant offers, in my estimation, an excellent authentic Italian culinary experience that is worth your money. This is not your everyday eating joint, but one which is worth visiting once in a while, especially when the urge to travel, either first time or a subsequent trip, to Italy is itching within. 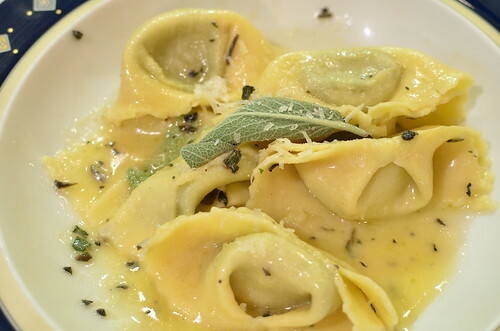 This foodie’s restaurant visits were quite worth the money spent, and they sure beat the price of a round-trip ticket to Europe, if only for a short moment, until the sense of wanderlust for Italia returns again. Great review and beautiful photos! Look forward to reading more. Thank you and I appreciate your readership. Hope the blogs inspire you.